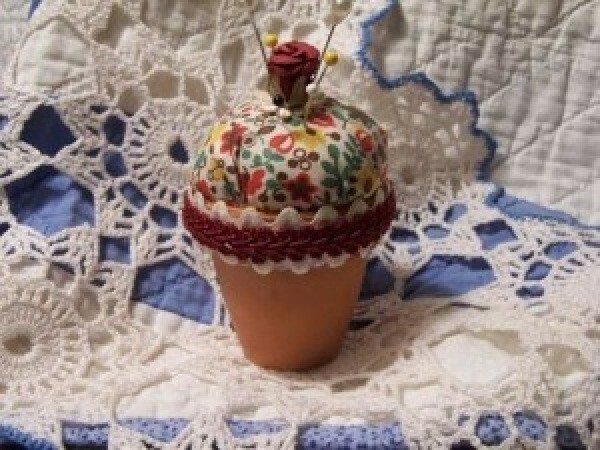 You can easily create a unique pincushion starting with a small clay flower pot. This is a guide about making a clay pot pincushion. 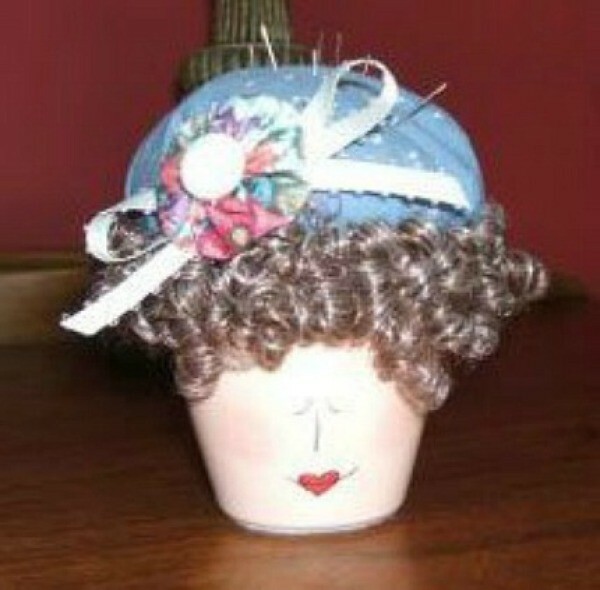 Place this pincushion miss on your dresser for a pin keeper or top her off with ornamental hat pins. These would be great to make for Mother's Day or birthdays. Basecoat the clay pot flesh tone. Let dry. Lightly draw face with pencil on center of pot as shown in photo. Paint the heart mouth red. Use the pen to draw face details. Use some blush and a cotton swab to make her some rosy cheeks. For the hair, apply glue around pot rim. Press hair or fringe over the glue covering the entire rim; trim excess if necessary. To make the pincushion hat, cut a 6 inch fabric circle. Hand sew a gathering stitch 1/8 inch from the edge. Pull threads to gather, stuffing with fiberfill as you go; knot thread. Apply glue around inside of pot rim. Place the "hat" in the pot with the gathered side facing down. To make the yo-yo flower, cut a 2 inch fabric circle. Hand sew a gathering stitch around the edge; pull threads to gather at center and knot. Flatten center. Sew or glue the button to the center of the yo-yo. Tie a ribbon bow and glue it to the back of the flower yo-yo; trim ribbon ends if necessary. Glue the flower to the hat. This is so cute! It would be great as a purple hat with red flower for Red Hat Society ladies. Have to try it! Thanks. Hi, She is so cute. Possibilities are endless. I was thinking for the hair you could use a steel curly scrubber(oops forgot the name). You could do a cat face, or dog, baby & bonnet! Thanks for sharing. This is a cute pincushion using a terra cotta pot for the vessel to hold the batting in. You could paint the pot. I chose to decorate it with sewing trimmings. Turn the pot upside down on the cotton fabric and draw a circle 4 inches larger then the pot opening. Cut the circle out. With a needle and thread do a running stitch around the circle close to the edge. Gather the circle closed as you go, leaving an opening large enough to stuff. Stuff with lots of batting. Make it very tight and pull the thread taunt until the hole in completely closed. Wedge the fat ball of stuffing into the pot and glue with hot glue or fabric glue. Smooth out the wrinkles if any. I put a small flower on the top with a rose on it. I glued 2 rows of rick rack around the top. The I put some trim in between the rick rack. Add cute pins and enjoy! To make a cute pin cushion, take a small clay pot, and stuff with fiberfill very firmly, until overflowing. Tuck a scrap of fabric over it, forming a nice dome, and hot glue inside the rim of the pot.